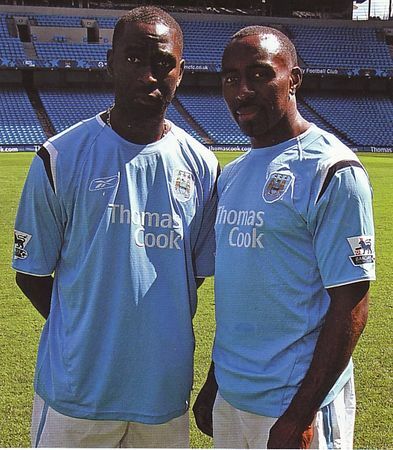 Stuart Pearce’s first pre-season in charge saw him bring in ex England strikers Darius Vassell, a £2M buy from Aston Villa and Andy Cole to strengthen the squad. In addition Kiki Musampa’s loan was extended for a season and Yasser Hussain was signed on a short term trial contract after a recommendation by Ali Bernabia. On the way out of the club were Paul Bosvelt who joined Heerenveen at the end of th last campaign, Jon Macken joined Crystal Palace for an undisclosed fee, Christian Negouai moved to Standard Liege for a nominal fee, Steve McManaman was released and City’s biggest loss was the transfer of Shaun Wright-Phillips to Chelsea for £21M a sum of money that would mostly be used to keep the Blues afloat financially. The news of SWP’s move to Chelsea was mooted on the day of City’s first pre-season friendly, a 1-0 defeat at Tranmere . The next day City drew 1-1 at Macclesfield and following the game the news filtered through that the SWP would be leaving the club. The Blues then travelled to Bangkok, having been invited to play in the prestigeous Asia FA Premier League Trophy, City played 2 games against Bolton and Everton drawing both 1-1. Back on English soil City won 2-1 at Stoke and drew 1-1 at Sheffield Wednesday . The pre-cursor to the new season saw a strong City side beat Olympiakos 3-1 in the Thomas Cook Trophy at Eastlands. The Blues were at home again a week later for the first Premiership game of the season, watched by the biggest crowd of the day they could only manage a 0-0 draw against West Bromwich Albion . However away from The City of Manchester Stadium Stuart Pearce’s team set out their stall for the season as they beat Birmingham 2-1 and then 2-1 again at Sunderland and for 24 hours the Blues stood atop the Premiership. A third 2-1 win follwed as City beat Portsmouth at Eastlands. City were unbeaten going into the Manchester derby at Old Trafford, and they remained that way earning a point in a well fought 1-1 draw against United . Stuart Pearce was again recognised for his efforts as he was awarded the August Barclays Manager of The Month award, and typically it acted as a ‘poison chalice’ as The Blues slipped up at home to Bolton losing 1-0, in an amazing game where City hit the woodwork no less than six times. It was another embarrasing exit from the Carling Cup as City were beaten on penalties at Doncaster in the 2nd round, and then it was three defeats on the trot as Pearce’s team lost 1-0 at Newcastle . The demands of TV coverage meant that City had to kick off their Sunday match a week later at a ridiculously early time of 11.15am, however Stuart Pearce’s side were wide awake as they beat Everton 2-0 at Eastlands to leave The Blues in an excellent 6th place in the league after ten games. Another excellent home win, 2-1 against West Ham was followed by a 1-0 defeat at Arsenal. The yoyo form continued with a 3-1 win at Eastlands against Aston Villa and then a 2-1 defeat at Fulham. The Blues then went two games without scoring a goal at Eastlands, drawing 0-0 with Blackburn and losing 1-0 against Liverpool , however they found their shooting boots again at Charlton winning 5-2, the best away win City had achieved in the Premiership. City couldn’t keep the scoring going and lost 2-0 at West Brom but then beat Birmingham 4-1 at Eastlands. Although Stuart Pearce’s side scored three goals at Wigan they still ended up losing 4-3. They then lost at home to Chelsea 1-0 and drew 0-0 at Middlesbrough on New Years Eve to leave the Blues in 9th position going into 2006. With the transfer window open Stuart Pearce was looking to strengthen the squad although in the December AGM Chairman John wardle had said “Some money would be available for teambuilding… but we are not talking huge amounts”. The start of 2006 didn’t start too well for Stuart Pearce as City were well beaten 2-0 by Tottenham at Eastlands. The manager had detected ‘a little bit of apprehension and fear’ creeping into the team, and in an effort to try and freshen things up he brought Robbie Fowler back into the team for the 3rd Round FA Cup tie against Scunthorpe, and Robbie didn’t disappoint as he scored a hat-trick in a 3-1 home win. Before the Manchester Derby at Eastlands the City squad was boosted by the loan signing of 23 year old winger Albert Riera from Espanyol, the Spaniard made his home debut a week later in a fantastic 3-1 win over Manchester United keeping City in tenth place in the league midway through January. Joey Barton who had been in new contract terms decided things weren’t going his way and handed in a transfer request. The euphoria of the Derby victory was soon forgotten as Bolton beat City 2-0 at The Reebok and a few days later it was announced that after 92 appearances for the Blues Robbie Fowler was leaving having been given the chance to re-join Liverpool, who he conceded were always the team he wanted to play for. City moved into the fifth round of the FA Cup with a 1-0 home win over Wigan . 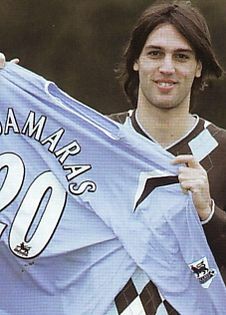 With the transfer window about to close, Stuart Pearce made two signings, splashing out £6M on Heerenveen Greek striker Georgios Samarasa and Matthew Mills who came in on a ‘free’. Want-away Joey Barton suffered the boos of the fans but turned in a man of the match performance as City beat Newcastle 3-0 at Eastlands but couldn’t do the same at Goodison Park as Everton beat the Blues 1-0, however shortly after the game he confirmed that he wanted to stay at City and had re-opened talks over his contract.